Windows 10 users can now control many aspects of Spotify, the popular music, podcast and video streaming service, by using Cortana, the intelligent voice-control virtual personal assistant built into Windows 10. 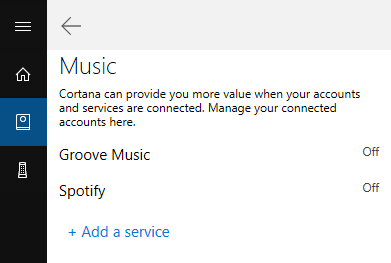 The integration of Cortana and Spotify was released soon after Microsoft discontinued its own digital music streaming service, Groove Music (previously known as Xbox Music and Zune Music). All Windows 10 users running Windows 10 Creators Update (v.1703) or newer can link Spotify to Cortana. The feature was previously available to Windows Insiders on Windows 10 Redstone 4 Preview Build 17063 and Harman Kardon Invoke users only. The best part is, the integration with Cortana works with both free and premium subscription Spotify account. Click or tap on Spotify. If Spotify is not yet listed, click or tap on + Add a service and select Spotify. >A separate window will open for you to sign into Spotify account, and grant the necessary permissions to Cortana to connect and access the Spotify data. You need to install Spotify Music app from Microsoft Store or from https://www.spotify.com/ for Cortana and Spotify integration to work. 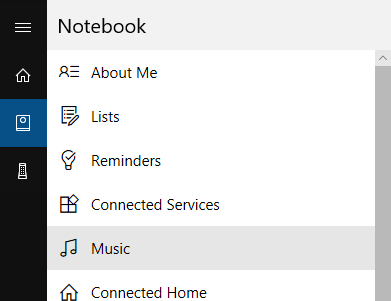 “on Spotify” may not be necessary if you only have Spotify connected to Cortana. If may be required if you connect multiple music source to Cortana, especially when support for iheartradio, TuneIn, and others arrives. Do note that Spotify support in Cortana is currently only available for Cortana in English (United States). So if you’re using Cortana in another language, you need to change the Cortana language to English (United States) to see option about Spotify.